We are delighted to launch Our Future: A Vision for an Environmentally Sustainable Bristol. 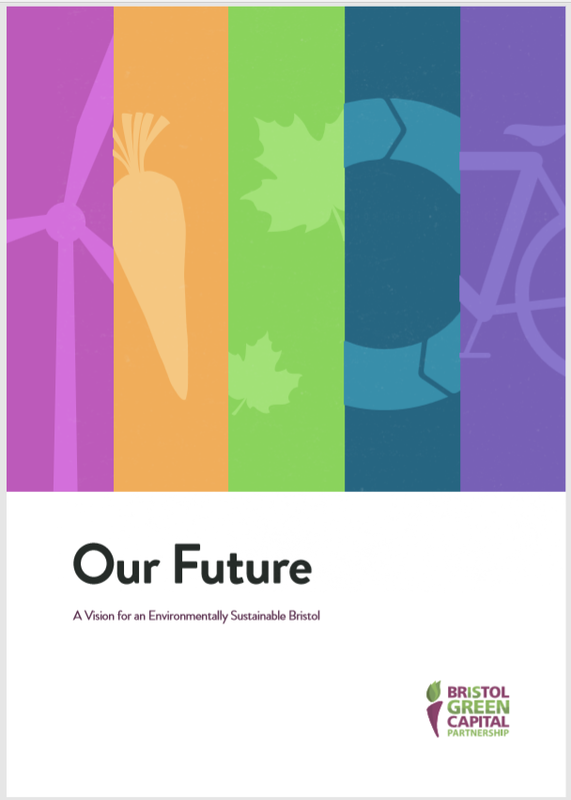 This sets out a series of ambitious yet achievable actions and timelines across our five themes: energy, food, nature, resources and transport, which were developed in close collaboration with Partnership member specialists. These give detail to the Partnership’s long-standing shared high-level vision of a sustainable city with a high quality of life for all. Our Future outlines 25 key areas for action for each of these 5 themes, from expanding renewable energy generation and increasing the amount of land used for community food growing, to doubling the abundance of wildlife, reducing residual household waste and increasing the number of journeys made by active modes. These actions also formed the Partnership’s contribution to Bristol’s One City Plan, the first iteration of which was launched last week, with environment among its 6 themes. Working towards these actions will strengthen the city’s ability to thrive in the face of major environmental sustainability challenges, and bring huge health, social and economic benefits to those living and working in the city. We know there is an urgent need to accelerate the pace of change, and this vision will help individuals, organisations, and the city collectively determine what they can do to step up to these challenges to enable us to move as quickly as possible towards our shared vision for Bristol. This year, we will be working closely with Partnership members and other city stakeholders on taking this forward. The Partnership will also be facilitating a new Environmental Sustainability Board which will help to deliver the environmental elements of the One City Plan and the actions in Our Future, including becoming a carbon neutral city. On the challenge of accelerating progress towards carbon neutrality, we will be holding a major Gathering of Partnership members in March 2019. Look out for further announcements soon. Our Future has been made possible by the contributions of many Partnership members, and we thank all of those who have given their time and expertise to make this a reality. We would also like to thank for their generous in-kind contributions, GENeco and Wessex Water for providing significant staff time, and Yoke for the excellent design.